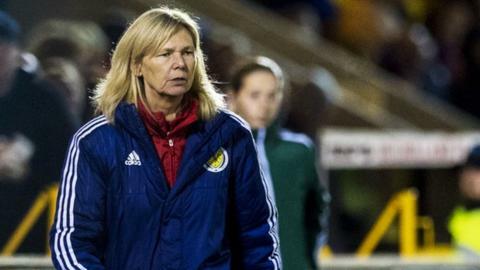 Scotland's hopes of making the final of the Cyprus Cup tournament suffered a blow as they lost 2-0 to a slick South Korea side at the GPS Stadium. South Korea and Austria, who beat New Zealand 3-0 earlier at the same venue, have four points from two Group B games, with the Scots a point behind. Anna Signeul made six changes to the Scotland side that started the 3-2 win over New Zealand on Wednesday. A goal from Ji So-yun and a Cho So Hyun penalty sealed the win for the Koreans. With four games in eight days to consider, Signeul brought in youngsters Erin Cuthbert and Fiona Brown in place of Jane Ross, who is sitting on 99 caps, and Manchester City striker and Christie Murray. Central defender Ifeoma Dieke and midfielders Leanne Ross, Caroline Weir and Jo Love were the other players introduced. South Korea were expected to provide a different test from the physical New Zealanders and they did not disappoint, producing some excellent passing play. Both sides were playing neat possession football but neither goalkeeper had much to test them in the opening 45 minutes. The best stop, with her feet, came from Scotland keeper Shannon Lynn just before the half hour, again from Jung. At the other end there was plenty of running and pressing by former Glasgow City team-mates Cuthbert and Brown, but little to trouble Kang Gaee in the South Korean goal. The game came to life three minutes into the second half when South Korea's star player, Ji So-yun, had been well policed in the opening period, found space to take a shot from 20 yards. The Chelsea attacking midfielder dispatched a crisp low drive into the corner of the net beyond Lynn. Brown spurned a good opportunity to score at the other end when put through on the goalkeeper, sending her shot the wrong side of the post. Ross then squandered a similar chance but in between the South Koreans had two good opportunities to double their lead. Her namesake was then brought on for the 100th cap. She was one of a trio of substitutes sent on just after the hour by Signeul, who had replaced right back Frankie Brown with Kirsty Smith at the start of the half. The Hibernian defender conceded a penalty and received a yellow card from Austrian referee Barbara Poxhofer for the foul on Jung which led to the second goal. South Korea captain Cho So Hyun stepped up to beat Lynn. The goal was probably deserved on the balance of chances in the second half and the scoreline means Scotland's chances of winning the group are out of their hands ahead of their final group game against Austria on Monday. Scotland manager Anna Signeul: "They were a good team and they definitely wanted to win on the day. So did we, but it's small margins. "We looked well organised defensively, it's just that we couldn't create as much on the midfield. "Up front Erin and Fiona were great in the first half but they got tired in the second. "It's fantastic that Jane (Ross) has reached 100 caps and it's just a pity we didn't win as well. "We saw Austria in the earlier game against New Zealand and they're a very organised, tough side. "We have to beat them on Monday and hope that South Korea don't win as well if we are to have any chance of reaching the final - but we said at the outset that this tournament is about looking at players ahead of the Euros."